Attention! 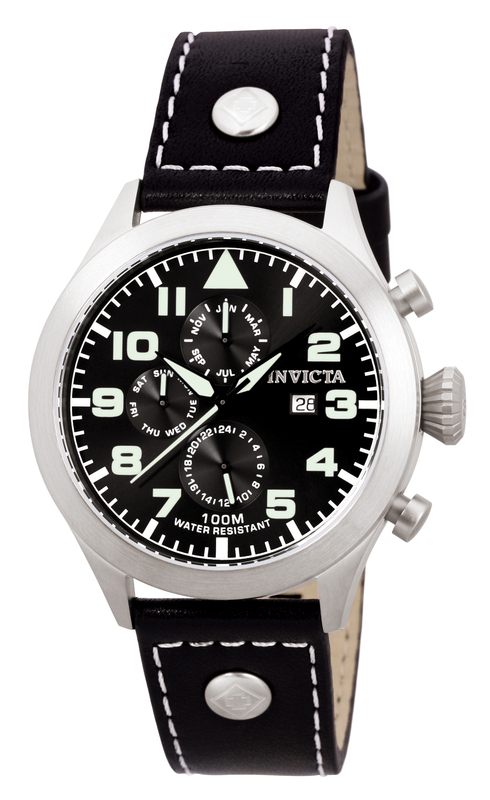 At ease…that’s how you’ll feel wearing the Invicta Terra Retro Military 0350. It will grab your attention with its good looks, and keep you at ease with its casual style and sturdy construction. This piece of the Invicta Force collection salutes our military with a 24-hour subdial, stainless steel case and black leather strap. Several similar watches are produced by Invicta. The 0351 is the same design but with a white face. The 0352 has a brown face. There is also another series with a slightly darker “gun metal” finish on the case. In each of these models you’ll find an easily read face due to the size – 45 mm diameter, large Arabic indexes, and well laid out sub-dials. You’ll also find high quality materials and intuitive design. Users say the dials are easy to set and maintain using two push buttons and the textured crown. Pros: For a high quality watch this price can’t be beat. All of the materials and workmanship are high quality and durable. The watch is easily sized to an average to large wrist. Cons: Smaller wrists may be overwhelmed by the large watch face. One owner complains that the band does not adjust small enough for his wrist. On the other hand if you have a thicker wrist you’ll be pleased to find a watch that can accommodate you. Several owners also note that the hour and minute hand luminous portions have a very similar length. In dim light when you’ve lost track of the time and the hands are close together it will take more than a glance to discern the time. Also be aware that though the case is water-resistant the leather band should not be submerged and neither are rated for diving or swimming. 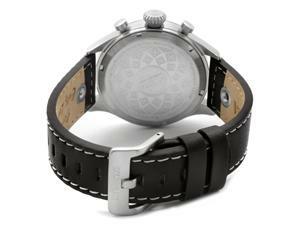 In all the Invicta 0350 has several nice features for a casual men’s every day watch. Price for value this watch can’t be beat.